Original Fifty Shades of Grey Publisher Venture Into Small Town America with the Release of White Trash: A Story of Murder, Mayhem, and...Fainting Goats? White Trash by Alexandra Allred (The Writer's Coffee Shop Publishing House), is a fast-paced, laugh-out-loud book that serves as a bitter social commentary on American hypocrisies and prejudices. Allred is no stranger to controversy. Her first novel, Damaged Goods, was an emotional and surprisingly funny look at how big business is destroying the health of people in her small Texas town. 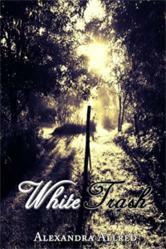 In White Trash, she turns her focus from environmental to social, all while keeping her signature wit and charm. No topic is off limits. White Trash explores racism, domestic violence, gun running, drug abuse, and the underlying theme of hypocrisy that sometimes runs rampant in small town USA. Allred is an entertainer with purpose. She has a gift for combining socially important issues with her outrageous sense of humor to create novels that make readers laugh out loud as well as make them think. When Thia Franks returns to her hometown of Granby, Texas, the very place to which she’d vowed never to return, Granby’s worst and best elements force the new single mother to face both her past and her destiny. At first, it seems that nothing has changed: Chester Kennedy’s goats continue to run rampant through the town; Officer Tina Wolfe stands accused of racial profiling the growing Hispanic community; Thia’s gun-wielding neighbor believes a squirrel has it in for her; and the town’s local newspaper owner prints only what she believes the citizens should know. But when a young black man—an upstanding and popular citizen of the small, east-central Texas town—is brutally murdered, everything changes. Everyone is being watched. Everyone is being judged. Alexandra Allred’s writing career began following a stint on the U.S. women’s bobsled team. After being named “Athlete of the Year” by the United States Olympic Committee, she became an adventure writer. While writing for a variety of national publications, she test drove the Volvo Gravity Car, donned a dog attack suit, played professional women’s football, and even outran a beefalo mix (that’s a buffalo/cow mix to you city folk). She turned to fiction writing using her rural Texas homestead as fodder for storytelling. When not writing, she lobbies for healthy children. Allred lives outside Dallas, Texas, with her husband, children, and a plethora of animals. The Writer’s Coffee Shop Publishing House is an up-and-coming independent publisher based in New South Wales, Australia. They recently gained a great deal of attention with Fifty Shades of Grey, the international literary sensation they released in June 2011 and is now represented by Random House. Launched in October 2010 with the vision of working alongside talented authors while providing quality e-books to the growing marketplace, TWCS publishes a wide range of fiction titles and is sure to have something for any appetite. Read the first three chapters of the hilarious "whodunit" novel White Trash by Alexandra Allred.